An exceptional winter hat with traditional Germanic form - this one actually looks pretty good, at least with the ear flaps up. Austrian Bundesheer surplus. Sharp-looking winter hat with a visor. Just like the summer model, but thicker and featuring ear flaps that can be worn over the head or covering the ears - at the cost of looks. Additional small flaps with snap-fasteners can be used to reduce sound damping. Sizes in standard European hat sizes: circumference of the head in cm. In used but serviceable condition. Some caps do not have the cockade, or it's crossed over with a black marker. Parempaa hinta-laatu suhdetta saa hattu kaupoilla etsiä, enkä usko löytyvän. Monipuolisesti puettavissa, tarkoin suunniteltujen yksityiskohtien vuoksi toimiva päähine. Partiolaiselle enemmän kuin täydellinen talvi-lakki keväthangille. Pienet koo´ot sopivat lapsille ja nuorille. Snadisti kadehdin muksua kun sen kokoa löytyi ja minä jäin ilman. buhuhuu..
A very good winter cap, in very good condition ... very usefull in the mountains ! This thing has so many snap fasteners on it, it needs to come with an instruction manual to tell you what they’re all used for! So please adopt one, give it an other chance to have a good life... out there in the cold. This is an exceptional winter hat for the amount of money you're paying. As far as I can tell the hat is new and there's no tears or marks on it. Some of the buttons are mysterious and I don't know what the red bulls-eye is for but if anyone asks you can just tell them its the brand or something. The only bad thing I have to say about this product is that the largest size is a bit snug on me. That's because I have a big head though so it shouldn't be a problem for most other people. Best 5 dollars I've ever spent. I spend 2 dollars on this cap. Could not go wrong, fits perfectly and looks almost new. Great buy! This hat is just great. It's thick enough to keep out a lot of water and keep you warm yet I never seem to get too hot in it. The only problem I have with it, is that if I try to button up the flaps in any other fashion than whats shown above in the top picture, the hat becomes too tight for me. Mine is from 2002 but it looks and feels brand new. Awesome winter hat, sizing is a little bit tight but nothing you can't handle. Great value ! I live in 20*F(-6*C) and colder winters. This is my subway hat in case I loose it which will be inevitable... I won't be upset for the cost. Perfect quality and very warm. Thanks. love it. -30 Canadian winter and this thing is cozy as ... well its just very warm unless there is a stiff breeze. still cant figure out what this button on a string is for. 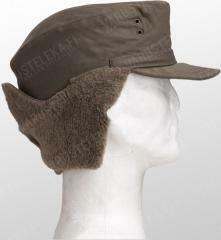 Good cap, like the swedish m59 wintercap. Is surplus so its a bit of a lottery if you get a gone one or not. En bra keps, väldigt lik svenska m59 vinterfältmössa. Det är lite av ett lotteri om du får ett bra exemplar eller ej eftersom det handlar om överskott. Har tidigare besällt från denna butik och är lika nöjd varje gång med leveransen och fraktpriset. Kommer garanterat beställa ingen. These are fantastic caps for the price. The only thing I would suggest is that you order one size larger than normal. It appears these have been washed and may have shrunk slightly!! This cap orks great in central Canada. With all the flaps down and buttoned it is suitable at -25°C, or -30°C if there is absolutely no wind. If there is a fair amount of wind, or it is colder than -30 you should use this cap with a balaclava. If it is colder than this I would recommend getting a hat made with rabbit or coyote fur. Most of the European surplus "cold weather" kit is suitable for Fall weather in places like Canada, however, this cap will truly set you up for winter almost anywhere in the world. There are many useful buttons and snaps on this hat. The other reviewers may put you off by their description of the complexity of this hat, but it isn't difficult if you understand that you just line up the male buttons with the female buttons and put them into each other.. It's actually quite simple if you just attach the buttons that naturally line up. There is a nice button attached to an elastic band which is used to button the ear flaps over your neck and chin when the weather gets COLD. The elastic is simply to prevent the front of the cap from popping open when you talk, or if you have an unusually large chin. Think of it as a sort of buffer for your chin. The cap loses some of your warmth through its ventilation holes at the top, which isn't necessarily a bad thing. 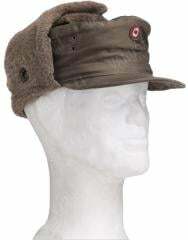 The cap has ear holes with flaps and buttons so you can choose have them open or closed. These holes and flaps are the biggest drawback of this hat because I experienced -33°C wind blowing right through the holes and right into my ears, even though the flaps were closed. This is why I recommend a balaclava with this hat when it is very cold. At least be prepared to cover your ears with something if you don't have a balaclava. It looks good on me too, but not everyone looks good wearing a cap like this. The best part of this cap is how the ear flaps cover your neck and chin. This is the best idea for a winter cap that I've ever seen. 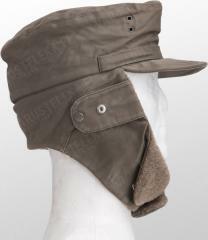 Perfect winter cap of quality and style! It's better to choose one size bigger you would normally do (winter cap should anyway be more spacious than summer model, so that there's air to insulate). Half star goes away only because the Austrian military badge is so tightly sewed that it's diificult to remove it, but that's of course not fault of the hat, but just a question of taste to like a cocarde or not. 2 came like new and sized well, perhaps a bit snug. I would size up if unsure. Very nice hat! Very warm and well made. 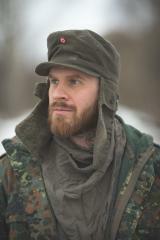 Great deal for a winter hat if you don't mind looking like you stepped off a WW2 battlefield. For €1.6, what kind of complaint could I give for this hat? The tag says it's from 1985, so for a 33 year old hat, it's looking pretty good. In fact, it's like new. I'd even believe it was un-issued if they'd told me. The cockade looks fairly dicky, I can't deny. People keep saying it looks like the Target corporation logo. Whatever, it's the cheapest hat I've ever bought, yet probably the best one I own. Go figure. Although the hat might not be among the cream of the crop in terms of "fashionability", ever since I bought it and put it through use during winter, I couldn't stop noticing that the hat had some sort of striking similarity when put side-to-side with the hat that the rebels from Star Wars used on Hoth, which might be good or bad depending on personal taste. I couldn't resist the look after the said realization. 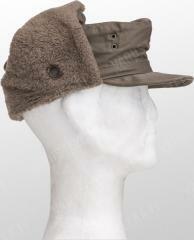 The hat is relatively cheap, but the hat offers a lot of "choices" when it comes to wearing. A lot of buttons, flaps, oh my! They run about a size too small, unfortunately; it fits my wife though. 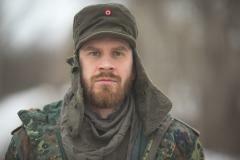 As I mentioned in another review, I have this problem where wool hats of the watch cap style tend to ride up over my ears which isn't really compatible with Finnish winters, even in somewhere sleepy and safe like Riihimäki. So I was on the lookout for something with earflaps. I have been keeping my eye out for one of these hats for the last 2 or 3 winters but they tend to be sold out fairly soon after they are restocked. I finally got one a few weeks ago and this week the temperature here in the wastes of Häme has dipped below zero and guess what? This hat does the trick. I actually prefer it with the flaps down. Admittedly it draws glances that you wouldn't describe as admiring when worn that way but what do I care, my ears aren't naked and in danger of falling off. The hat looks like its new, the material is nice, it's comfortable and ear-friendly and ridiculously cheap.The only bad thing was that they always sold out so quickly but now I have one so I don't care. Tilaus oli nro.58 lakista, tuli mytty, josta lakiksi oikaistuna, hädintuskin 56 cm sai mitattua. Mietinnän jälkeen päädyin kokeilemaan kostutusta ja venytystä/oikaisua kulhon ympäri. Sain aikaan sopivan talvilakin. Hatussa ei ole missään merkittynä kokonumeroa. Hyvä lakki, mutta voisitte hiukan katsoa mitä lähetätte. Great quality and quite versatile once you learn the uses of every button. In my case, it's a little tight for my head, so maybe order a size one centimeter bigger than you are used to.